FuGuE is my own personal interpretation of the #1GAM theme, which for February 2016 was set to HOME. Made during #1GAM February 2016 gamejam. This is an early prototype, presenting the core game-play and mechanics. 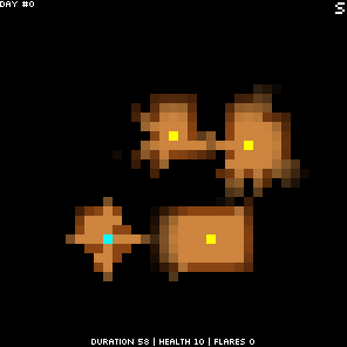 The rationale for this project was implement random procedurally generated levels and line-of-sight (with illumination). You are a tiny little square that every single night needs to find its way back home through a dark maze. Scattered across the maze there are the keys and the door to your home (azure and green shiny and tiny little squares). The compass in the top-right corner displays the next item (key or door) direction. Once all the keys have been collected, the door will appear. Foes (menacing red tiny tittle squares) are wandering through the corridors and rooms of the maze, as well. When spotted you will be chased! Run and hide or drop a bait/flare to distract them. The game will end when the player duration or health drops to zero. Use the arrow keys to move the avatar. Press the X to release a bait/flare.